I finished reading another book of fiction. 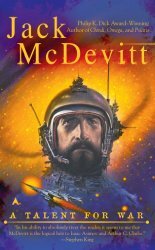 This time I read science fiction, a book by Jack McDevitt called A Talent For War. I liked it. The mystery had a nice bite to it, and I really liked Alex (the hero). The reading mini habit I’ve been working on, 2 pages of fiction a day, is starting to chafe. I’m not that into this habit. I don’t like reading bits and pieces each day. It’s frustrating me—I’d rather sit down and read large passages at a time, and I’m just not sure why I even want to make myself read 2 pages a day. Well, that’s not exactly true. I thought it would make it more likely for me to read more books. It was probably working like it was supposed to, but … I don’t care. I’ve been reading a few pages here and there of A Talent for War for almost a week, until finally I just got annoyed and sat down today and finished it. Took me 8 hours. Which I didn’t have. But because I’d worked myself into the part of the book where I just wanted to know what was going to happen, I ended up using the majority of a day I had set aside for other things to read instead. Alrighty then. Decision time. I’m bailing on this mini habit. Reading is kind of an all or nothing thing for me, and I like it that way. NOTE: I decided to make an effort to read more books this year. And since I have so many unread books, I set a goal to read at least 60 of the books in my backlog by the end of the year. Here’s the log if you want to see how I’m doing.